Mom and Pop are deceased, but I know that they are around in a spirit-in-the-sky kind of way, so I want to thank them for raising me and not interfering with my feminine ways when I was growing up. I don't know much about this image except that it was posted on a crossdressing Pinterest page. My guess is that it is from the mid-20th Century and that the girl in front is a femulator, but I am not so sure about the girl in back. Is she another femulator or a female friend or relative of the femulator? Your guess may be better than mine. Thanks for the posting Pinterest photo. The photo and the gurls clothing style has the '50's-60's style reminiscent of the photos in the book "Casa Susanna". I vote that both are femulators. BTW does anyone out there have the means to create a REAL LIFE B&B/ Casa Susanna? Book my room now.... V.
It's the actor Divine in the chair! 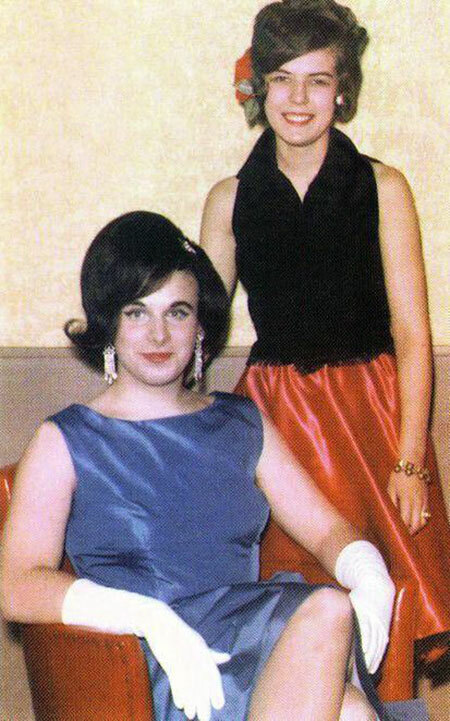 Google image search says it's "Divine dressed as Elizabeth Taylor for a school Halloween party with his date Diana Evans"
There used to be a Gay resort in the Pocono's that had a Crossdress weekend once a month. Great food. Even the locals went there to eat. You should be thankful that your parents just let you be yourself! My mother always used to fret over her precious baby "BOY"! and my father expected me to be a "MAN"! 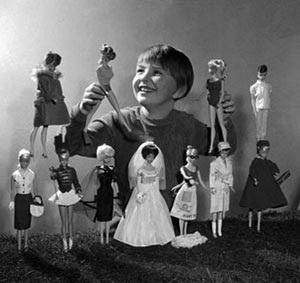 back in the mid 60's growing up my mother suspected what I was, and I got the "talk" about boys don't behave like that!